The art-rock iconoclasts have come a long way since their tragic childhood, orphaned by a train (or was it a Lion?) 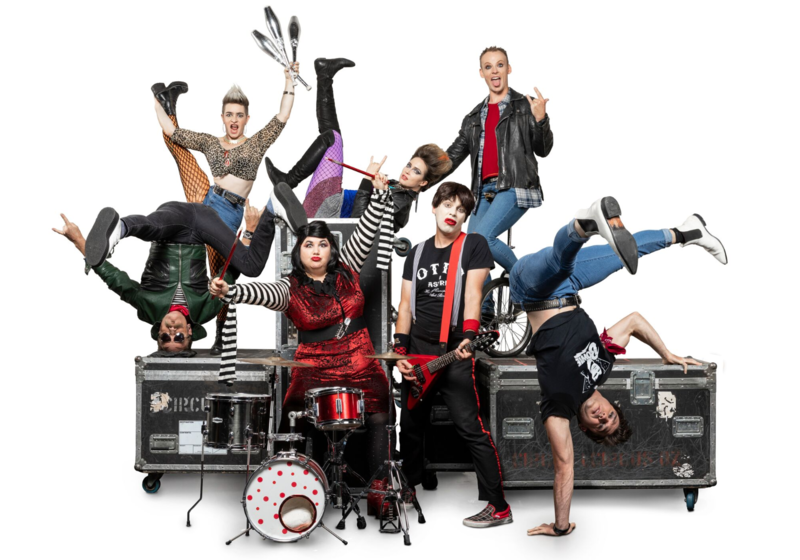 Maxim Boon meets the duo as they prepare to share their explosive life story, with a little help from Circus Oz, in Rock Bang. Interviewing German pop-rockers Otto and Astrid Rot, aka Die Roten Punkte (that's The Red Dots for those of you whose Deutsch ist nicht so gut), is a bit like being on a rollercoaster blindfolded: you might not have a clue where you’re headed, but it’s one hell of a thrill-ride all the same. Inexplicable icons of Berlin’s underground music scene, the pair bear a striking resemblance to Australian comedians Clare Bartholomew and Daniel Tobias, albeit caked in enough greasepaint and bright red lipstick to make Kurt Weill blush. Astrid strongly denies any Aussie connection: “Who is this Clare? I don’t know anyone named Clare,” she insists, before offering me a vegan doughnut. Before I can accept, both Rots have launched, full tilt, into their rubber-ball repartee, not so much finishing each other’s sentences as leapfrogging the full-stops altogether. Fans of their previous outings, or their self-titled web series Otto Und Astrid, will be familiar with their trademark combo of deadpan zingers, frenemy callbacks, wide-eyed cluelessness and punk cliches. Most recently, Astrid snatched headlines across the country after being featured in The Weekend Age’s Day On A Plate column, revealing the gut-busting number of calories it takes to power her rock-n-roll lifestyle. Unsurprisingly, my conversation with the pair is nothing short of batshit – in the best possible way. Imagine if Jonny Rotten, the Emcee from Cabaret, and David Hasselhoff got together to make a children’s TV show. This dynamic duo would be the hosts. With accents thicker than sauerkraut, the orphaned siblings begin sharing their extraordinary backstory — a tale tinged with tragedy, but absolutely dripping in surreal humour. “We grew up in a small outer suburb of Berlin,” Astrid explains. ”It’s like out in the woods somewhere,” Otto interjects. ”And very sadly on my 12th birthday, we were on our way to the zoo when our parents were killed.” Astrid begins. ”By a Lion,” Otto finishes. These conversational bumper-cars set the tone for our chat. And in less endearing hands, this might be frustrating for a hapless journalist. But the whipsmart dynamic between the pair — a shtick they have honed over more than a decade on the comedy, fringe and music festival circuit — is addictively entertaining. Astrid’s withering, throwaway putdowns of her long-suffering bruder, and Otto’s childlike zeal and unflappable need to please, are underpinned by a quintessentially Mittel-European earnestness. There’s a subtle double-hinged quality to their banter; somehow openly mocking the affected seriousness of the rock establishment and arthouse avant-garde, while still preserving a clear affection for both cultural touchpoints. But none of their past ventures compares to their latest spectacular. Rock Bang will bring the Rot’s unique story to life in a music-filled “rock opera” biopic. And for a narrative with so many highs and lows, it seems particularly apt that the production will also feature the eye-popping acrobatics of Melbourne-based troupe Circus Oz. Co-created and directed by the company’s Artistic Director Rob Tannion, the show is part rock-concert, part-comedy, all-action, with the daredevil physicality of Circus Oz’s talented performers cheek-by-jowl with the headbanging hijinks (and dysfunction social skills) of Otto and Astrid, who will also be debuting a few as yet undisclosed circus skills of their own in the show. For Die Roten Punkte, working with the “bendy people” of Circus Oz has been a career high: “This is the best show we’ve ever made,” Otto beams. In fact, such is the idiosyncratic creative process shared by the Rots — “Usually, the way we write a song is that someone has an idea, and then someone else yells about it, and then the other yells louder, and then when someone gets tired, Astrid wins the argument and that’s how we make a song,” — the pair are convinced that Circus Oz is the only company capable of such an audacious collaboration. First published on 24 October, for The Music.